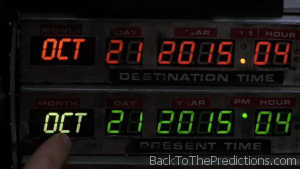 Doc pronounces the year as “20-15″…which is actually fairly common to hear this year. Marty pronounces the year as “two thousand fifteen”…which was a common way that people in the 1980s referred to years beyond 1999. Back in the 1980s, it was extremely rare for anyone to refer to any year past 2009 as “twenty-ten” or “twenty-fifteen” and it was almost always “two thousand ten” or “two thousand fifteen”. Now that we’re living in these years, it’s actually fairly common for people to refer to the years as “twenty-ten” or “twenty-fifteen”. It’s a subtle bit of dialogue, but by having Doc use “twenty-fifteen”, it helps give the impression that he’s more familiar with this future and Marty is still thinking like someone from the 1980’s. We’re chalking this up as the first accurate prediction of real-life 2015 in the Back to the Future franchise. 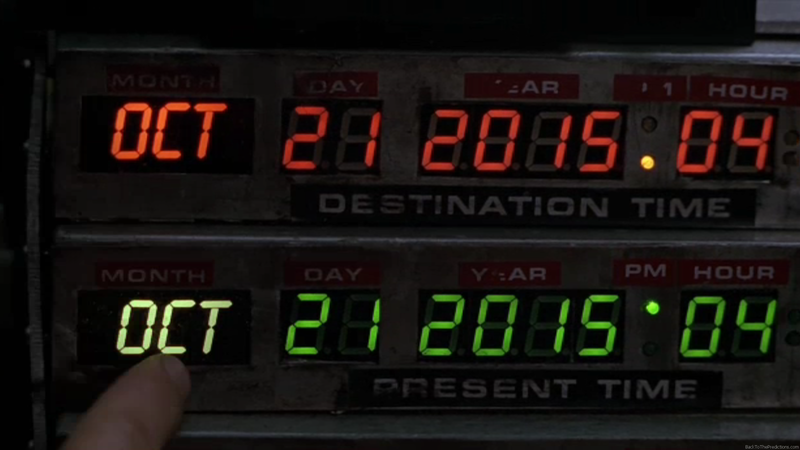 …and we’ll all just ignore the fact that the AM/PM indicators on the time circuits say that Doc meant to travel to 4:29 am and arrived at 4:29 pm.